To restore some serenity to your backyard, you’ll probably need to get your hands dirty, but luckily you can hire one of our skips to ensure whatever you tear out of the ground is put back into the earth, one way or another. 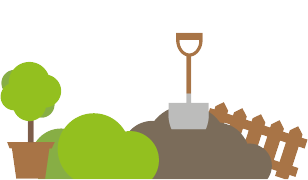 We’re partnered with a number of recycling and biomass plants that specialise in repurposing any garden waste you have to contribute towards renewable energies, making your garden clear-out a creative rather than a destructive process. The size of skip you’ll need varies greatly depending on the size of your garden, and the size of the project. If it’s just a case of shifting a little bit of garden waste, raking up the autumn leaves, pulling out last years bulbs and re-arranging the rockery, then a 2-yard or 4-yard skip will offer you ample space for waste disposal, or even a 1 yard skip bag if you’re producing minimal waste. However, if you’re planning on some full on landscaping, you’re going to need a something significantly bigger. Bear in mind that, due to weight restrictions when it comes time for collection, an 8-yard skip is as big as you can go if it’s going to be filled with heavy garden waste like soil and clay. If there’s a lot of heavy waste to shift and you don’t think an 8-yard skip will be big enough, the best bet will be to order multiple 8-yard skips to guarantee the lorry can take everything you need to get rid of.